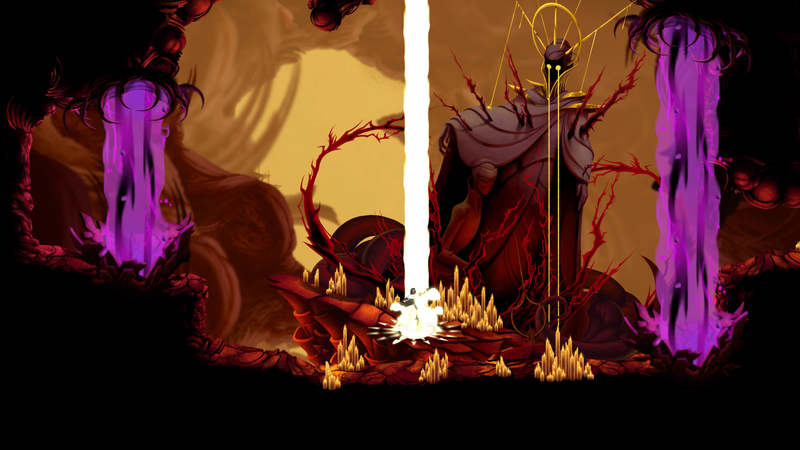 Following up on the success of Norse mythology action RPG Jotun, Thunder Lotus Games goes back to the drawing board with Sundered, a replayable Metroidvania heavily inspired by the writings of H.P. Lovecraft. The hand-drawn art that drew so many eyes to Jotun returns, only what we’re seeing in the first trailer and screens posted over at the PlayStation Blog is twisted and dark. The main character, Eshe, wanders an abandoned world beset by horrors, battling massive bosses and swarms of smaller creatures. William Dubé, creative director at Thunder Lotus, promises Sundered will feature complex mechanics and meaningful choices between sanity and madness. The world is procedurally generated, so expect plenty of replay value as well. Sundered is coming to PC, Mac, Linux and PlayStation 4 next year. Check out more of the first very pretty screenshots below.